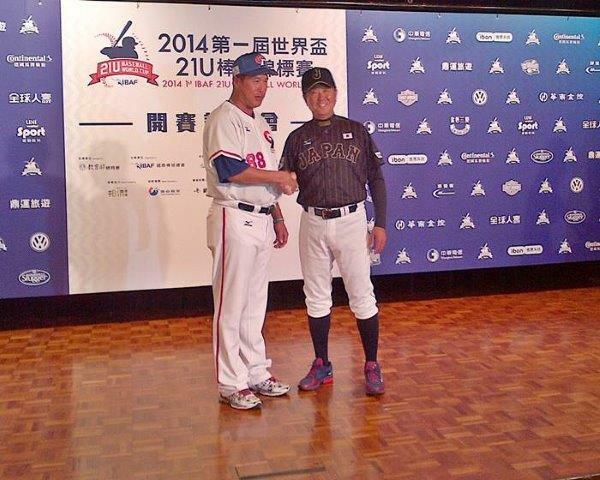 TAICHUNG, Taiwan -– Leaders from Japan’s and Chinese Taipei’s National Teams reunited in Taichung and generated a media frenzy at the press conference that marked the eve of the start of the first-ever 21U World Cup Baseball. Japan’s 21U manager Katsuo Hirata and Chinese Taipei’s Skipper Chien-Fu Kuo-Lee played together for the Hanshin Tigers in Japan’s Nippon Professional Baseball (NPB) during 1993 and 1994. Hirata and Kuo-Lee are both making their debuts as National Team leaders. Hirata was the shortstop for Tigers for 13 seasons, while Kuo-Lee pitched for Tigers for six years. In ’97 and ’98, Kuo-Lee played for Hirata as the later became the manager of the Hanshin Club. Hirata currently is the minor league team manager for the Tigers while Kuo-Lee heads the Kainan University in Taiwan. World No. 2 Japan and No. 4 Chinese Taipei have been put into different groups and would only play each other in the Super Round Robin phase of the 21U world championship. Japan opens against Australia, while Chinese Taipei will face Mexico in the final contest of Day 1. Hirata made headlines last week when he pledged to deliver the 21U world championship to Japan. The 2014 21U Baseball World cup, which opens Friday (7-Nov), will be played over 42 matches and feature five of the Top 10 ranked baseball nations in the world and eight nations within the Top 15.